All-ages programming at Sled Island is sponsored by Lukes Drug Mart. 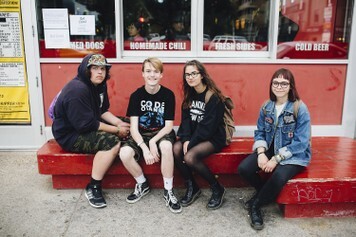 Sled Island is proud to offer an array of all-ages programming each year! With tons of bands playing shows open to minors, as well as comedy, film, art and special events accessible to attendees of any age, there’s always something for our younger pals to do! Exclusively for attendees under 18 years of age! Access more than 50 all-ages events for the price of a single show ticket. All-Ages Passholders must be under 18 years of age at the time of the festival (June 19 - 23, 2019). Valid ID required at pickup. A limited number of advance tickets are available for select all-ages shows each year. Advance tickets guarantee show access. Door tickets will be available for all all-ages shows not sold out at the time of the festival, subject to capacity. Show up early to get in!